Oscar Pistorius Is Leaving Prison Way Sooner Than You Thought — But He Won't Be Exactly "Free"
One-time Olympic runner Oscar Pistorius is getting out of prison — yes, less than a year after he was convicted of manslaughter in the shooting death of his girlfriend, Reeva Steenkamp. According to BBC News, South African correctional officials recommended that the paraplegic runner should be released in August, when he's eligible for probation under South African law. Pistorius was initially sentenced to five years in prison last October, after having been acquitted of first-degree murder. 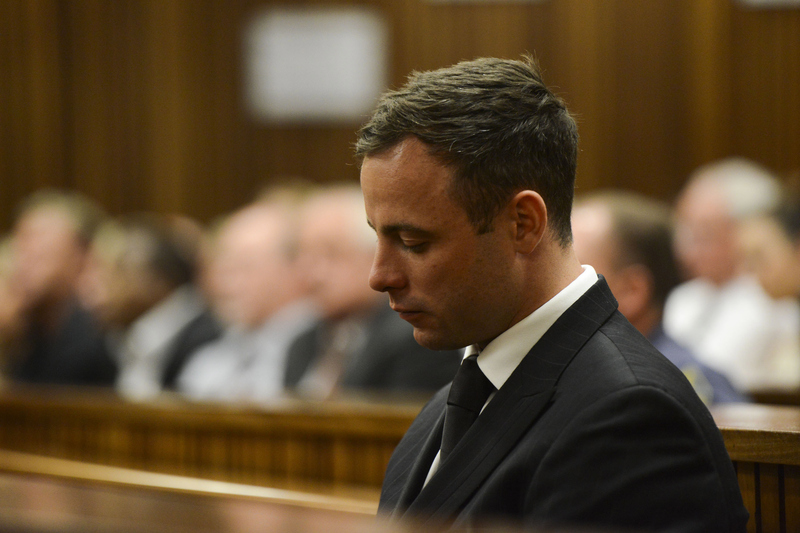 Pistorius' exact date of release is August 21, correctional officials said Monday. Officials added that the runner had "good behavior" in prison, a large factor in his release. However, Pistorius won't be entirely free just yet, as his release means probation and house arrest. Once an international sensation on the athletic level, Pistorius soon became a household name for entirely the wrong reasons. The runner who previously made headlines for competing in the 2012 Summer Olympics with prosthetic legs turned into an international criminal following his arrest in Steenkamp's shooting death, which occurred in Pistorius' South Africa home on Feb. 14, 2013. Steenkamp was found in the bathroom, fatally wounded from bullets fired through the door. Prosecutors alleged Pistorius intentionally killed Steenkamp, but the Olympian claimed he thought she was an intruder and acted in self-defense. Although Judge Thokozile Masipa found Pistorius not guilty of premeditated murder, she believed there was enough evidence to convict the runner of manslaughter. But what was perhaps more shocking than his conviction was his sentence: just five years in prison. Now, Pistorius is set to leave Kgosi Mampuru II prison after serving only 10 months, or one-sixth, of his sentence. It's the minimum amount of time the runner could serve under South African law. And despite his release from prison, the Olympian's legal troubles are far from over. Also on Monday, the South Africa Supreme Court of Appeals announced it would take up prosecutors' appeal of his murder acquittal at a hearing in November. If prosecutors win the appeal and the panel of judges overturns the previous decision, Pistorius could receive the minimum 15-year murder sentence.